“La merienda” is a traditional Latin American snack break which can be taken between breakfast and lunch, or between lunch and dinner. It’s different from most American snack or coffee breaks because la merienda isn’t something you would scarf down behind the wheel of your car, buy from a vending machine, or mindlessly munch while checking E-mail. It’s a moment each day, often shared with others, where you sit down at the table and savor what is more like a miniature meal. This tradition is about taking a moment to relax and truly appreciate comida, familia and amigos, which creates a thankful spirit. Nestlé Abuelita sent me some of their products to enjoy during our daily merienda and although I wish you could have been sitting at the table with me, I took some photos so you can share in the experience. I usually use the Abuelita "tableta" to make hot chocolate, and I love to add cinnamon. Nestlé Abuelita sent me the granulated form and instant hot chocolate mix packets which make it easier for the boys to make their own. Using hot milk instead of water provides calcium and a creamier drink. Merienda time with a cup of hot chocolate and a tamal de elote. “Yes, she’s the abuelita on the hot chocolate!” Carlos said. Are you ready for your merienda? 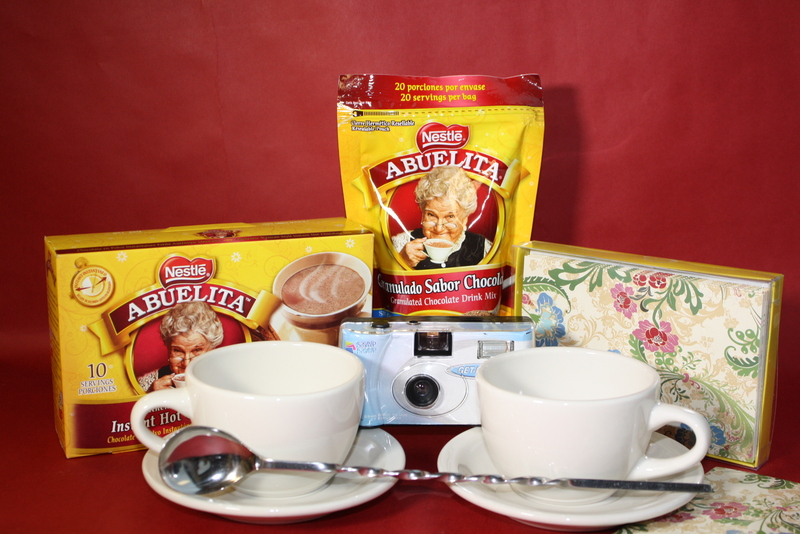 Below, find out how to win a Nestlé Abuelita Prize Pack. Also know that sometime on or around March 7th, you can visit Facebook.com/Abuelita and RSVP to join a special event where you’ll have another chance to win a merienda prize pack from Nestlé Abuelita. THIS GIVEAWAY IS CLOSED AND IS NOT ACCEPTING NEW ENTRIES. 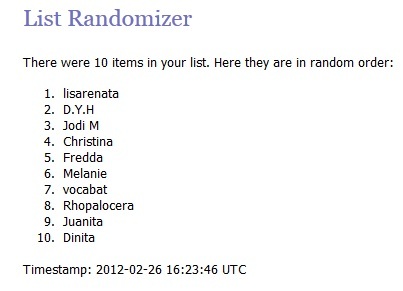 CONGRATULATIONS TO OUR WINNER: LISA! No purchase necessary. You must be 18 years of age or older to enter. You must be able to provide a U.S. address for prize shipment. Your name and address will only be shared with the company in charge of prize fulfillment. Please no P.O. Boxes. One entry per household. Make sure that you enter a valid E-mail address in the E-mail address field so you can be contacted if you win. Winner will be selected at random. Winner has 48 hours to respond. After 48 hours, a new winner will be selected at random. Giveaway entries are being accepted between February 20th, 2012 through February 25th, 2012. Entries received after February 25th, 2012 at 11:59 PM, will not be considered. The number of eligible entries received determines the odds of winning. If you win, by accepting the prize, you are agreeing that Latinaish.com assumes no liability for damages of any kind. By entering your name below you are agreeing to these Official Rules. Void where prohibited by law. Disclosure: I received products from Nestlé to facilitate the review and writing of this post. All opinions are my own. Previous Lana del Rey – Is she Latina? We like to have a mid morning snack, when the day allows. However, in our fast paced days often it doesn’t allow. Our “merienda” is often traded for our “cena” which is often a mug of Abuelita and some kind of pan dulce.. Thanks for this great giveaway! Sadly, we don’t practice merienda, although it’s something that my husband says he would like to do (as he did it with family and friends when he lived in Guatemala). We just don’t have the time with work, etc. Maybe it’s something we could do on the weekends though. We do buy, and love, the Abuelita’s hot chocolate. We actually just had some last night (with my husband’s homemade churros!)! I didn’t know they made it in polvo though – we’ve always just bought/used the tablets. On another note, where do you get all your old Spanish-speaking movies? Netflix, rental store, somewhere else? I’d love to get some of those old movies to rent for my husband! Melanie – Of course you could do it just on the weekends, Sunday afternoons we usually have a merienda as a family without even having really planned it – it just happens :) … Personally I take too many meriendas all by myself each day jajaja. As for the movies – your question made me laugh because the DVDs are… ahem, from the black market. LOL. We didn’t buy them, but an uncle of Carlos’s in El Salvador has bought many bootleg copies, (which are very common as you probably know), and sent them to us over the years. I have actually seen classic Mexican movies at Wal-Mart of all places though, the past year or two. They have big $5 bins near the electronics department – one holds English-language movies, and the other holds Spanish-language. If you can’t find them at your Wal-Mart, try one in an area with a larger Spanish-speaking population. Other places I’ve seen them: Latino markets and the store “Big Lots” has them sometimes, too. For us la merienda is something we do mostly in the afternoons, between lunch and dinner. Not every day, but on those days we do it is such a wonderful treat. I love chocolate abuelita and I also make mine using the tablets adding a stick of cinnamon and letting it simmer until nice and hot. Yum. Then I use my Mexican molinillo to froth it up. I especially love a hot cup of chocolate abuelita with some pan dulce. BTW- can you send me that recipe you mentioned before?!!!! Hola Natalie! … I think I would be the same way, (eating snacks and rarely making meals), if my husband didn’t insist on normal mealtimes. The kids and I are happy to just eat cheese and crackers, a PB sandwich or a bowl of cereal for dinner but Carlos loves a hot, formal meal. I was hoping you wouldn’t say that about the classic DVDs! (We love bootlegs, but I cannot confirm whether or not we have a ton of them in our home…). jejejeje ;-) Thanks for the tip about Walmart and Big Lots though. I never would have looked there, but now I will! PS: all of this talk about pan dulce and chocolate caliente is making me hungry. I think I’ll look for some right now! I’m actually enjoying a merienda right now at my desk at work. Today it’s trail mix. Sometimes an orange. I usually take a few minutes mid-morning to read a few of my favorite blogs and have a snack!! Amiga, did you know that there´s a “legend” that says that Sara García had her teeth taken out by a dentist so that she could portray the Abuelita more accurately when she was relatively young? I have no idea if this is true, but everybody “knows” it here en Mexico. Ja! I never heard that! Fascinating! … Wow, can you imagine? Talk about commitment to playing a role! Omg merienda is my favorite time of day! My bosses and coworkers are all Filipino and we have merienda everyday! Lo que me dejo con la boca abierta es que, ellos tambien en Tagalog le llaman merienda! jajaja. In every language i love merienda. Usually, we have frutis and nuts or sweet bread con cafe. Merienda is my absolute favorite time of day! I tend to take one in the late afternoon, before heading home from the office. Weekends, it is a given that we have a late-evening trip to the panederia for pan dulce!! No hay nada mejor que un pan dulce con atole del abuelita! We don’t really do that. Hubby works overnites but sometimes if he wakes up around 1 in the afternoon he’ll have a cup of coffee and I’ll sit and eat a fruit with him or drink a tea. We love to drink abuelita hot chocolate on the weekends though! Super sweet chocolate is not my thing and abuelita has the perfect amount! I have been dying to try the “instant” hot chocolate too.